Today music in New England homes and communities is broadcast through the airwaves, preserved on audio recordings, and reinforced in jam sessions and dance clubs. Before 1940, however, residents in rural New England communities listened to and performed music in more limited social spheres. Their performance venues were largely in the home, neighborhood, village, or work place. Fewer opportunities existed at that time to bring new music into the community or to share local music more widely. When commerce and the media began to dominate the music scene with the phonograph and, later, the radio, exchanges among musicians and fans transcended the local and broadened spheres of influence and radically altered the musical landscape.Drawing upon interviews and archival primary source materials, this book presents new insights into the musical practices and traditions of late-nineteenth- and early-twentieth-century rural Northern New England--a context that includes traditional ballads and hymns and, surprisingly, popular songs and commercial dance music. Jennifer Post lets the voices of ordinary people--the participants--tell us about their music and cultural history. Their stories are infused with issues of concern to ethnomusicologists, historians, and social scientists about landscape and community, gendered expression, imagined traditions, and historical representation. The author conveys that historical traditions are not always what they seem. 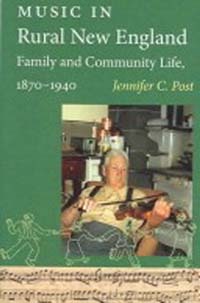 Post offers a startling new interpretation of vernacular music of the region: In contrast to many traditional scholars who have viewed ballads and folk music, particularly in Appalachia, as somehow a "purer" brand of lost musical traditions, Post finds that across Northern New England everyday people equally enjoyed and expressed themselves through an amalgam of folk ballads, dance music, and popular musical favorites. At the heart of this study is the recognition that the musical lives of individuals, their families, and their communities were constantly being negotiated in relation to social status, gender relations, local geography, and economic needs.